Lockdown, the newest release from Printz award-winning author Walter Dean Myers, couldn't have come at a better time. Burned out from a succession of novels that each read much like the one before it, lacking voice and pizazz, Lockdown provided a much needed - and much appreciated - change. This journey into the life of a boy who made a mistake and pays for it over and over again is both beautiful and sorrowful. From the back cover: For fourteen-year-old Reese, it's hard to stay out of trouble when the code at the Progress Center is survival of the fittest. Can he get a second chance, even it he's locked up in juvie jail? Funny, as I'm typing that blurb I'm thinking to myself that those are two rather weak sentences to describe the honest and explosive tale that is Lockdown. Reese is a boy you've known: someone who tries his best to stay out of trouble when the story of his life is trouble. A big brother in and out of prison, an addict mom, a microcosm society of hopelessness, this is what Reese grows up with and when that fateful day comes that he makes his own mistake and is sent to juvie, no one's going to let him forget where he comes from - and what little he has to look forward to. Reese has all kinds of obstacles to navigate at the Progress Center: physical violence, authority figures who alternately beat him down and maintain unrealistic high expectations of him, a crusty old racist in the retirement home he volunteers at, uncertainty about his future when he gets out. But Reese, despite his mistake, is self-aware and concerned for others. But even that gets him into trouble. How do you rescue a smaller kid from getting jumped when one more fight cancels out your early-release? I was struck and saddened by the way the disciplinary system in Lockdown worked to damage Reese's character rather than heal it because it was so truthfully portrayed. Even so, Reese shines in his interactions with his sister, Icy, and I found myself hoping against fate that good things would happen for him. His optimism under pressure was inspiring. Walter Dean Myers has one of the most vivid and real voices I have come across in Young Adult literature. I'd like to repeat that sentence three or four times, but I won't. He doesn't rely on dialect or slang to illustrate his setting and characters; instead, there is a natural rhythm to the narration and the dialogue that compelled me into the story, into the time and place and understanding of Reese's world. And yet, it feels subtle, not at all forceful or in-your-face. Myers is a master storyteller and Reese's tale shines under his treatment. 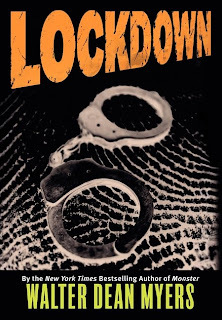 Lockdown will be released on February 2, 2010 and is a great book for reluctant and rabid readers alike. I highly recommend it. Sounds like a stunning book. It had better not take too long to reach NZ! Sounds amazing! I will keep my eye out for this one. Ditto. Sounds incredible. Thanks Kristin! I loved it to. It sunk into me and stuck with me. I love Walter Dean Myers and this book did not disappoint. Definitely. It wasn't a difficult read, per se, but it left me thinking and understanding a new perspective. All those people who throw out the old "pull yourself up by your bootstrap" line should read books like this. I really need to get some WDM in my life, stat. Lockdown looks excellent, thanks for the review, it's going on my TBR.